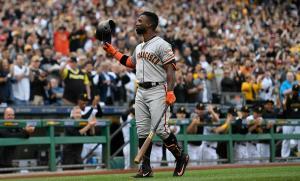 The Pirates hit four home runs and scored 11 to spoil Andrew McCutchen’s return to Pittsburgh, beating the San Francisco Giants 11-2 Friday night. 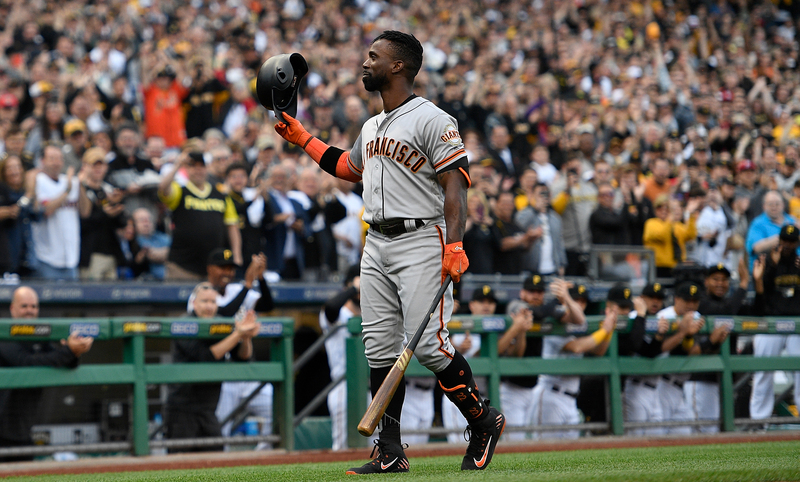 While his team may have been blown out, for 95 uninterrupted seconds Friday, McCutchen got to hear the 34,720 in attendance at PNC Park cheer him again, with chants of “M-V-P” echoing through the concourses. McCutchen came to bat with applause all five times he came to bat and the jumbotron played a pair of tribute videos for the man who did the lion's share of the work of making baseball relevant in Pittsburgh again. "This is one time in his life he needs to enjoy, because he did a lot of good things in this organization," catcher Francisco Cervelli said. Cervelli stood in front of home plate to pause the game to make sure McCutchen got as much applause as possible. "This guy was impressive for me, best player in this organization. He deserves all that." “I loved it. I loved to see his look in our dugout, and I loved to see him when he went out to the outfield and he's on the board and he's looking at the fans. Very special," Clint Hurdle said. There was also a ball game played. While McCutchen got the ovation to start the game, the remaining two-thirds of the former “dream outfield” got the offense going in the first. Gregory Polanco doubled to set up Starling Marte for a two run home run off Giants’ starter Andrew Suarez (1-2). Austin Jackson drove home two in the fourth off of Steven Brault, but Jordy Mercer broke the tie with an RBI triple to plate Sean Rodriguez in the home half of the inning. Jose Osuna followed with a pinch-hit two run home run to make it 5-2. Colin Moran kept the pinch-hitting magic rolling in the sixth with an RBI double. Josh Bell and Max Moroff homered in the seventh and eighth innings respectively. Brault got the win to improve to 3-1, but he was the only member of the bullpen to give up a run. Kyle Crick- who was acquired by the Pirates in the McCutchen trade in January- tossed a scoreless fifth, followed by Edgar Santana, Michael Feliz, George Kontos and Richard Rodriguez. McCutchen went 1-5 with two strikeouts, a double and an outfield assist. Taillon was removed after the third inning with what the club described as a “right hand laceration” on his third finger. Taillon made clear that this was a cut, not a blister. He suspects that he cut himself in the first inning with his thumb fingernail while throwing a curveball, but he felt good enough to keep pitching. He and the coaching staff came to a mutual decision after three innings that he should not push himself and risk further injury or a change in mechanics once it started to bleed. “I felt like I had pine tar on the ball, and I looked down and it was blood,” Taillon said. Chad Kuhl (4-2, 4.12) will try to build off the momentum of his seven shutout inning performance last Sunday as the Bucs take on Jeff Samardzija (1-2, 6.62) Saturday at 7:05 p.m..
2.72: The Pirates’ bullpen has recorded a 2.72 ERA since Apr. 12. 33: Mercer’s fourth inning triple was his 33rd extra-base hit from the eighth spot in the lineup since 2017- the most in baseball. 34,720: The number of fans in attendance Friday- the largest of the season.